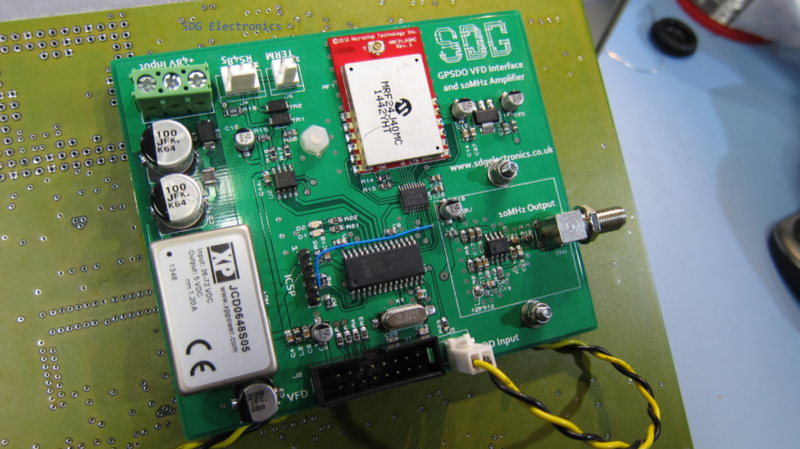 Several months ago I picked up a Symmentricom GPS Time and Frequency Receiver in the hope to create a 10MHz Frequency Reference for the lab. 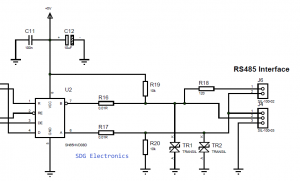 The unit was designed for telecommunications use so runs from a 48VDC power supply and outputs 2.048MHz rather than 10MHz, however I was hopeful that I’d be able to obtain 10MHz from the unit in some way. I posted a video shortly after receiving the unit exploring the unit for the first time. 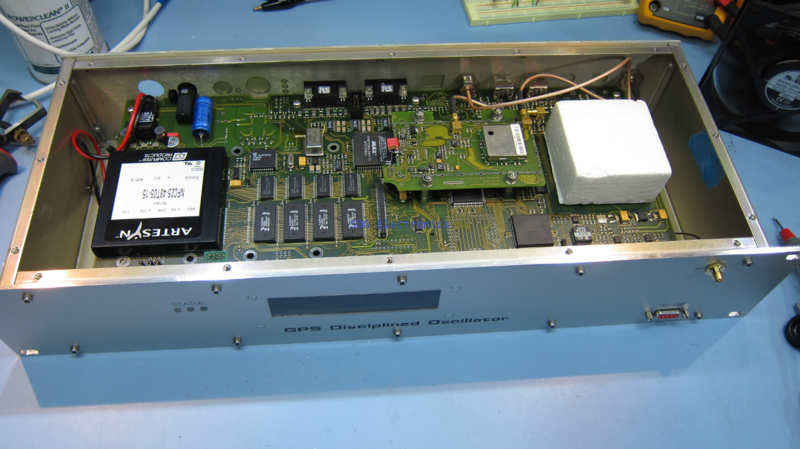 Fortunately the OCXO inside the unit was a 10MHz device so obtaining the 10MHz output would not be a difficult task. Had the unit not featured this device I would have used a separate 10MHz OCXO and created a PLL to lock the 10MHz oscillator onto whatever frequency OCXO was used within the device. 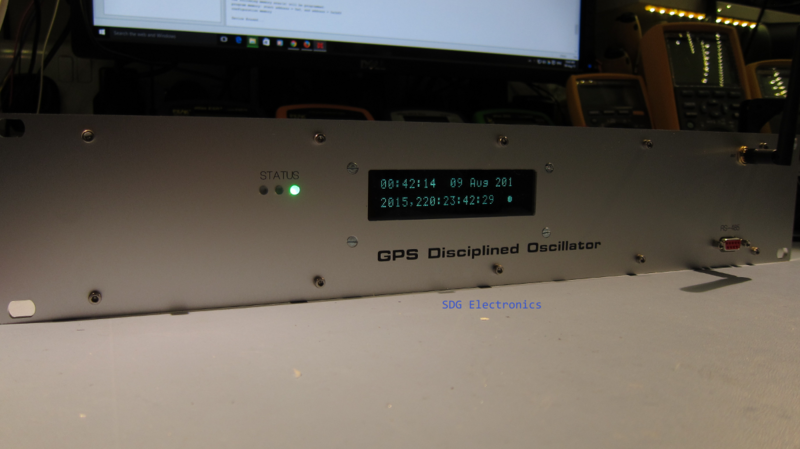 Other than the 10MHz output, I decided that it would be a nice feature to be able to use the Time of Day output from the device and also to jazz up the front panel with a display capable of showing some status information. 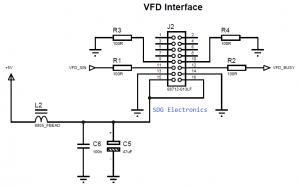 In this video I explored the Time of Day output from the unit and interfaced it with a Microchip dsPIC30F3013 16-bit Microcontroller to display the time and date information on a 20×2 Noritake VFD. 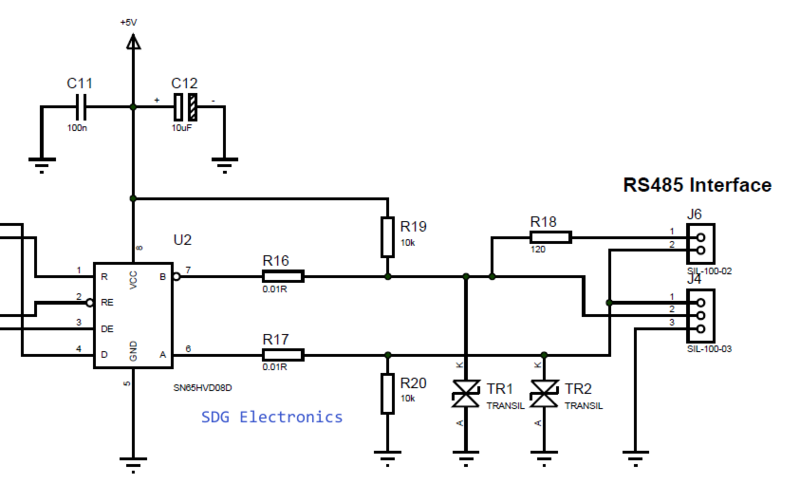 Following on from that video I started designing a PCB to make the modifications permanent. 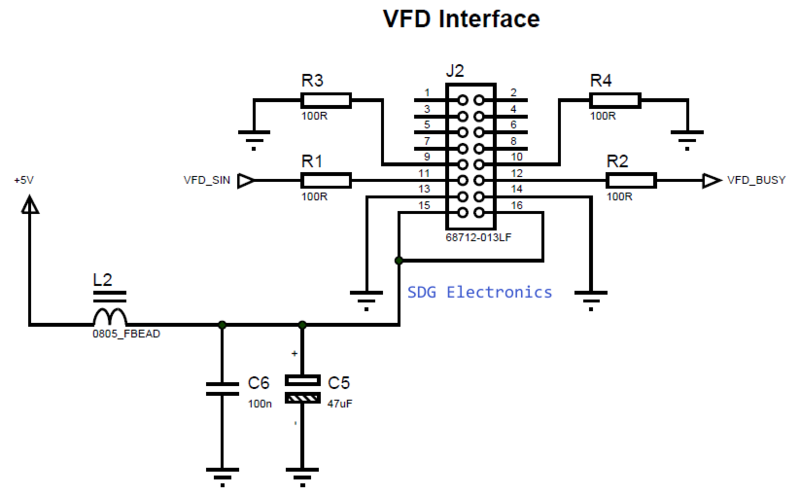 Starting with the microcontroller, I laid out the fundamentals for running the dsPIC30F3013 – ICSP interface, crystal oscillator, decoupling capacitors etc. Unfortunately, it looks like the EMUC3 and EMUD3 CANNOT be used for general programming and debugging. 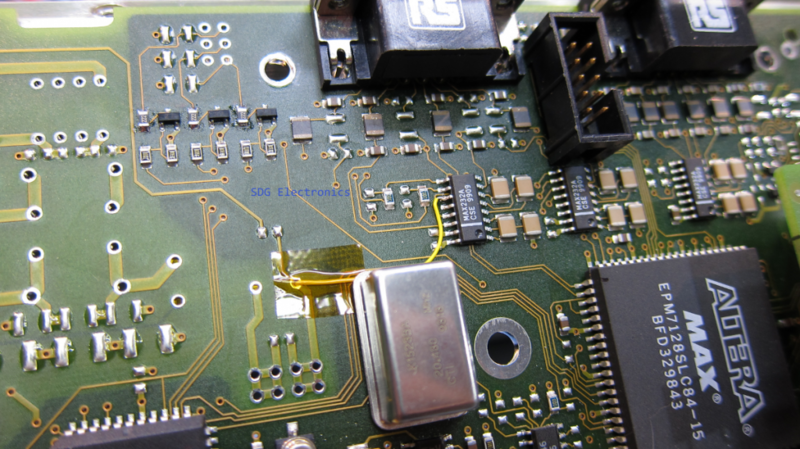 This is a mistake on my PCB and PGC and PGD must be used instead! 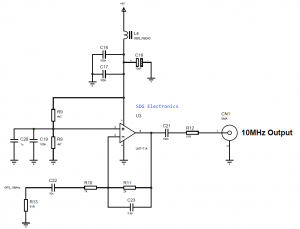 The 10MHz amplifier and attenuator was designed. I simulated this in Linear’s LTSpice to make sure this would work correctly. 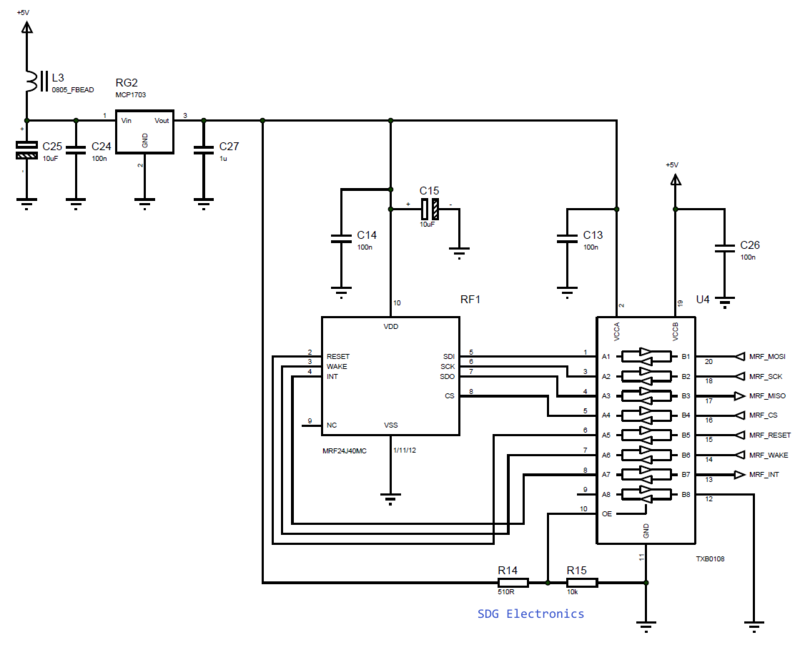 The bias resistors keep the signal centred around mid-rail after being capacitively coupled to the circuit. 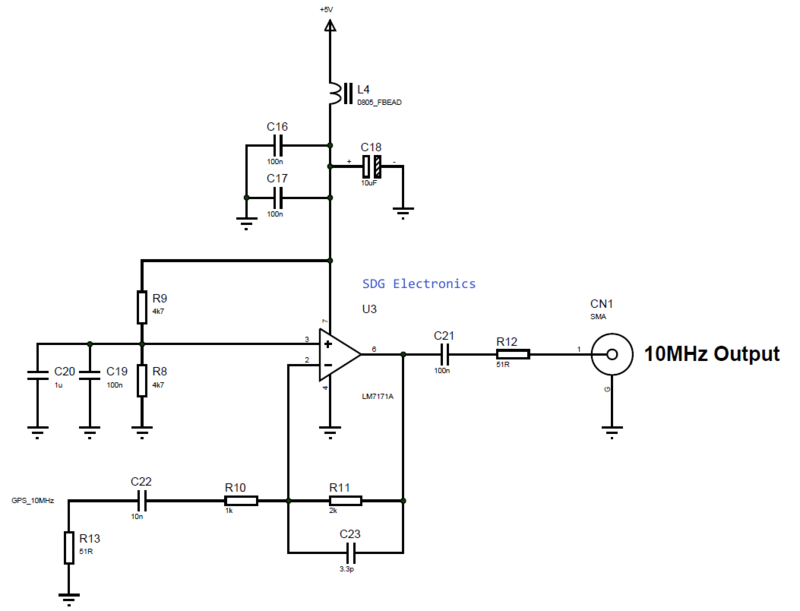 The negative feedback amplifier adjusts the output to 1V p-p for my equipment. 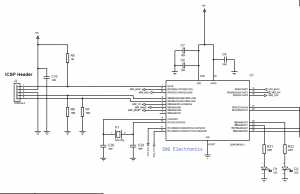 A new addition to the schematic was Microchip’s MRF24J40MC 2.4GHz transceiver device. This is something which I’m planning to add to many future devices and will allow the time to be distributed around the house. 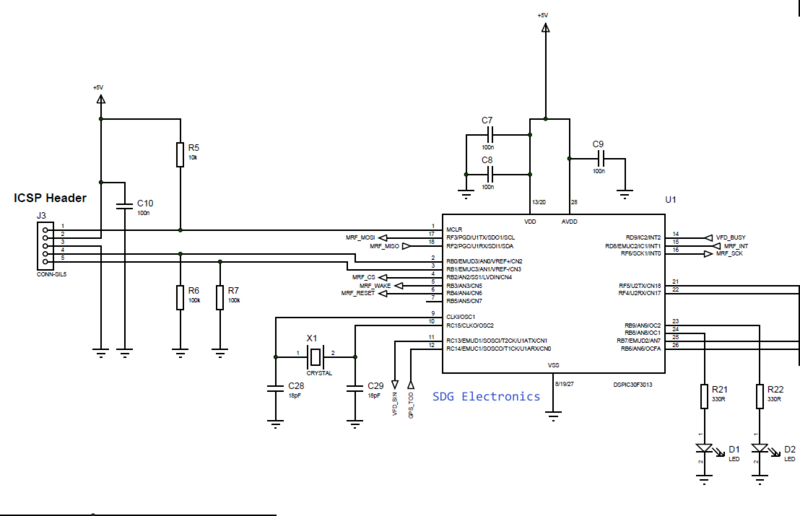 These devices are super cheap and a really nice design, although the Microchip MiWi stack looks a bit overcomplicated for my use, so I may trim this right down to the essentials for use here. 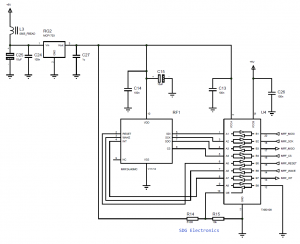 The PCBs were ordered from Elecrow in China and arrived within 7 days of placing the order! You can see the modifications for the ICSP header made with some Kynar prototyping wire. 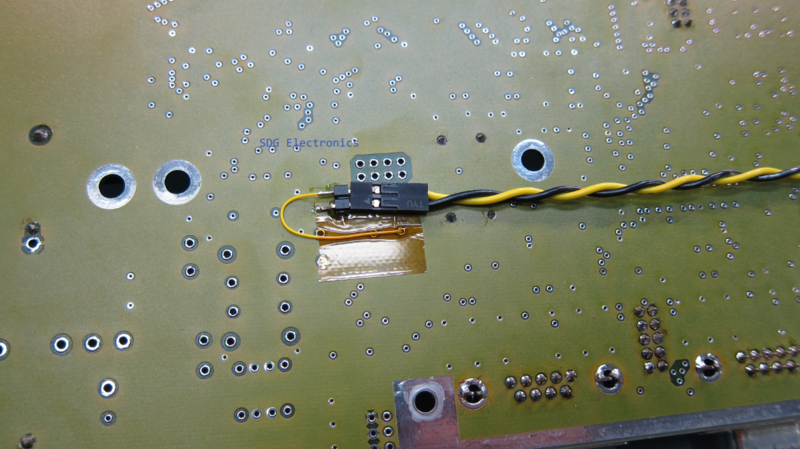 A 2 pin header was mounted on the reverse of the GPSDO PCB to attach to the new PCB. 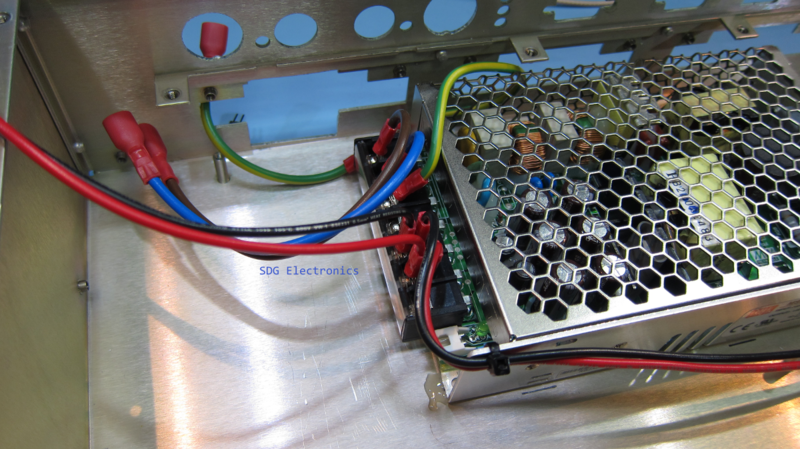 Next a 48V 100W Meanwell Power Supply was added to the chassis. Next the VFD was attached to a new front panel I had manufactured at Schaeffer AG designed to fit in place of the original front panel. 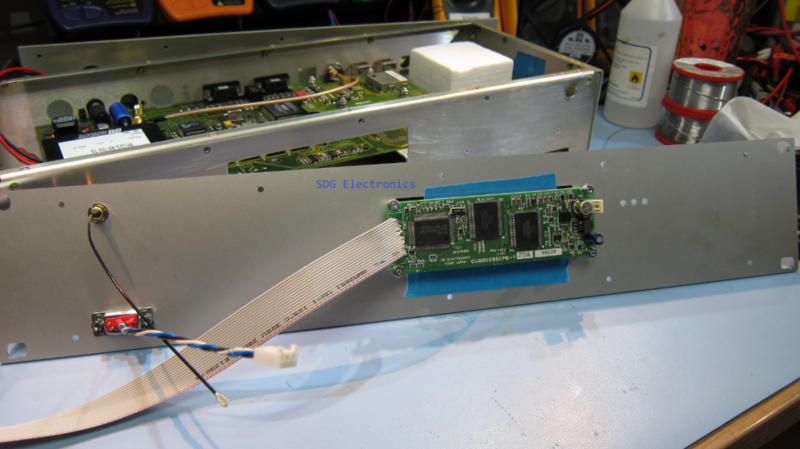 Finally, the unit was assembled together along with a new IEC connector on the rear for the mains inlet. 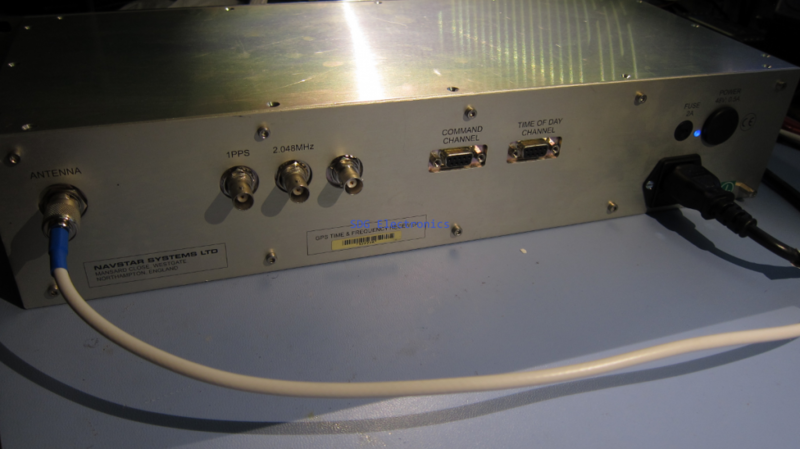 A new BNC connector was also added for the 10MHz Output. 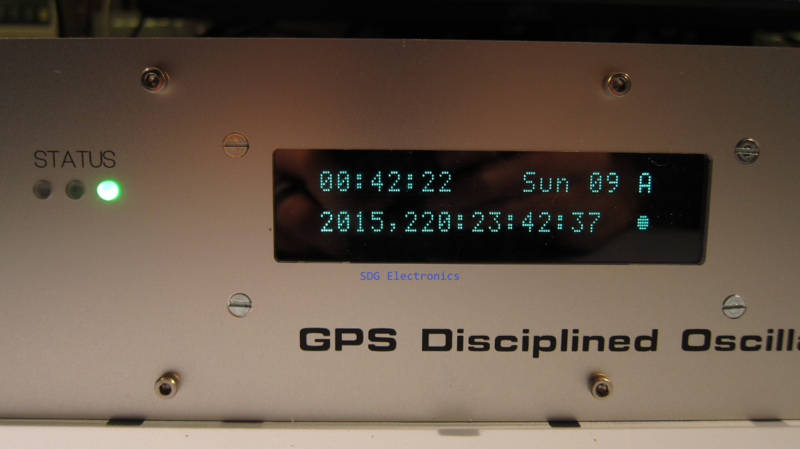 Finally the device was powered up and tested. All working! Nice project Steve – I particularly like the professional looking front panel! Are you going to publish the firmware for this project? Thanks, I still have a little bit of work to do on the communications interface but I’ll most probably publish the firmware for people to look through. Hi Steve, your motherboard looks the same as my Navsymm Proteus standards. Try sending 4 hex bytes: 0x00, 0xda, 0x00, 0x26 to the control port. If you get 180 bytes back I may be able to help you with some software.